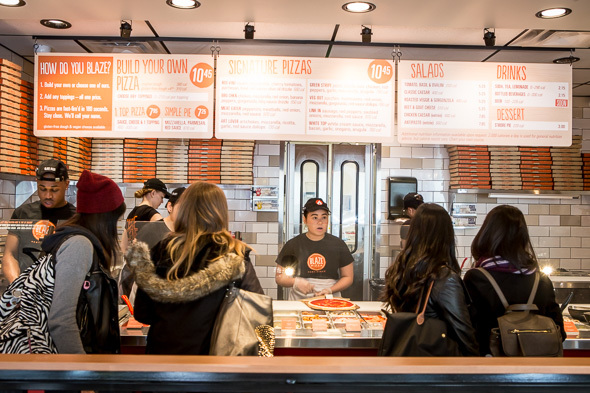 Blaze Pizza is the Chipotle of pizza. That's not to say they are in anyway affiliated, but they are both massive US chains that let diners customize meals on an assembly line. 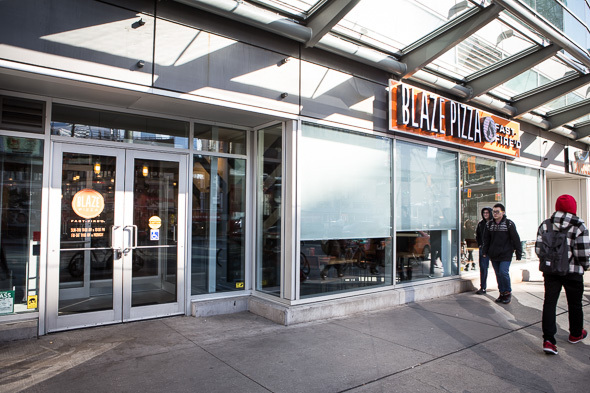 South of the border, Blaze operates 90+ locations including a few backed by NBA sensation LeBron James. General Manager Andrew Dorich tells me the brand is rapidly expanding with a new location opening every few weeks. The sole Toronto location takes over the space that was formerly Johnny Rocket. 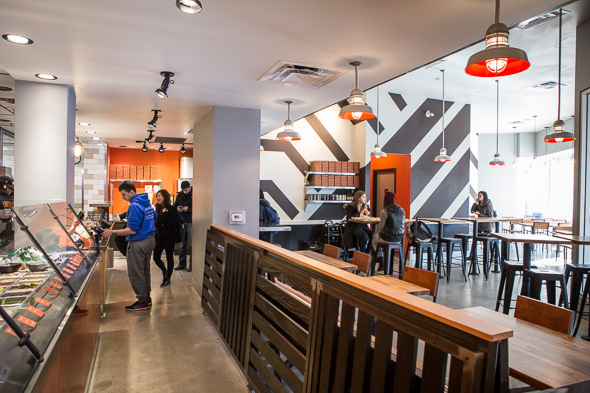 It's converted the diner into a fast-casual eatery featuring a takeout counter and about 60 seats in a contemporary setting featuring black and white graphics and pops of bright orange throughout. 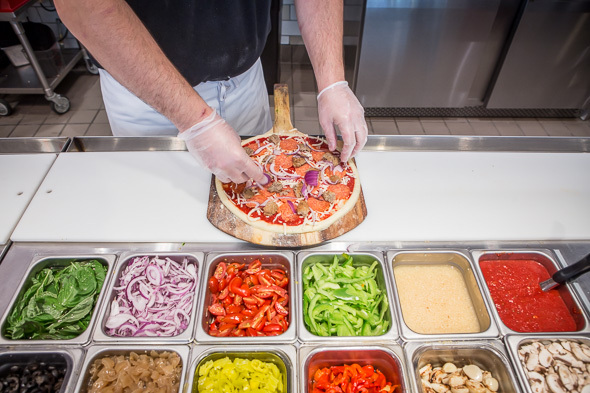 The gist of this joint is that 11-inch pizzas can be topped with any combination of ingredients for $10.45 and then fired off in an ultra hot ceramic oven in about 180 seconds. Forty different ingredients are on display including six different sauces, six different types of cheese, and three post-baking drizzles. It would be easy to go overboard but FYI, all the caloric information is listed next to every ingredient - which seems very American, rather rare in Toronto, and wholly appreciated by those that care (skip the math if you don't). 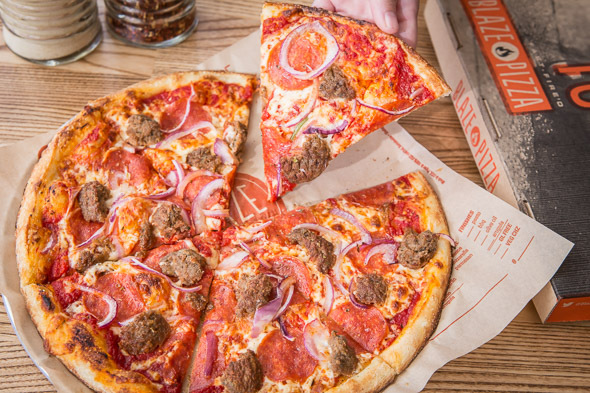 Ordering is as easy as pointing, but if you're feeling lazy just opt for pre-designed pies like the Meat Eater (also $10.45) featuring pepperoni and meatballs, red onions and mozzarella over a sweet red sauce. 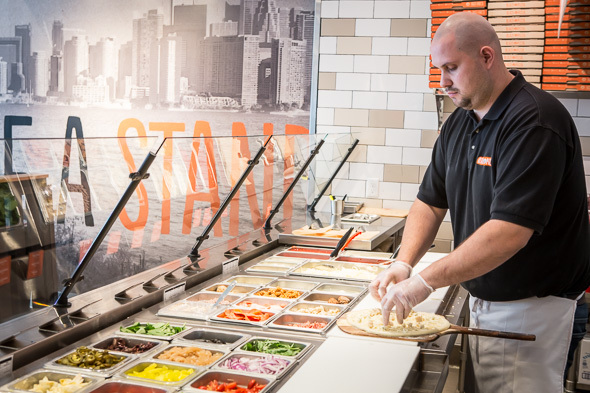 The dough is made in house and left to ferment for 24-hours before use. When ordered, a press forms and par-bakes the crust to help it hold its shape. Once cooked, it's light and just slightly chewy, the bottom is nicely crisped but it's pleasantly thin and foldable. To drink there are fountain sodas, plus two house lemonades ($2.15). 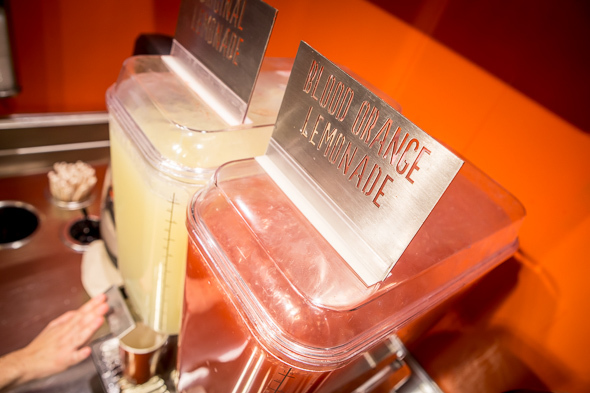 The blood orange lemonade is particularly good, and I'm thirsty for a refill just thinking about it. 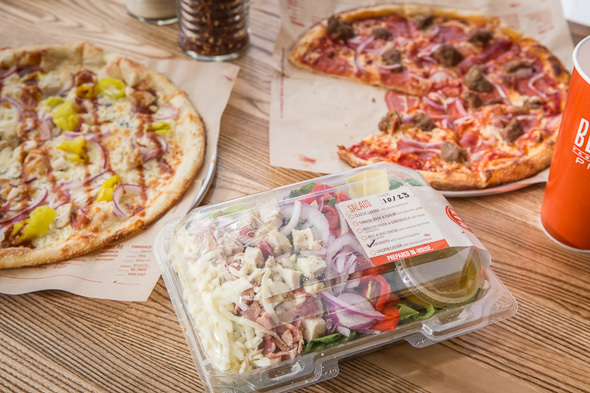 Aside from pizzas, there are half a dozen salads pre-made and left to chill for easy grab and go. The classic Caesar, beet and goat cheese, and roasted veggie with Gorgonzola are all considered sides and are priced at $5.25, while the Antipasto salad featuring grilled chicken, bacon, artichokes, roasted red pepper, red onion, shredded mozzarella and romaine constitutes an entree for $7.85. 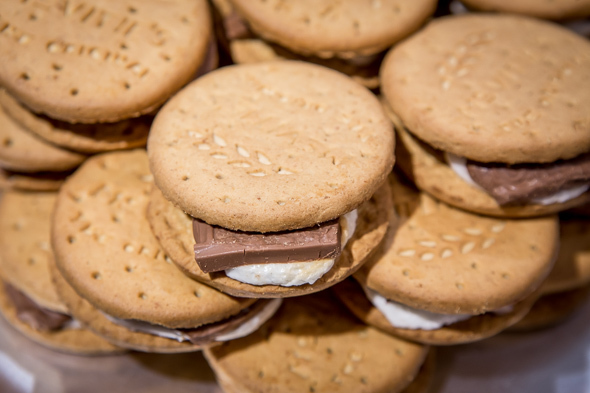 If dessert is essential, then there's just one option: s'more pie ($3), which is really just two graham crackers with chocolate a marshmallow smooshed between. 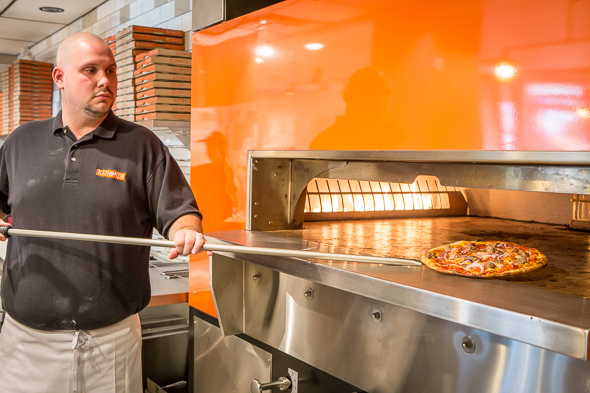 By request they'll pop them in the ultra hot oven, so consider heading back to the cashier for round two if you want to enjoy them warm. 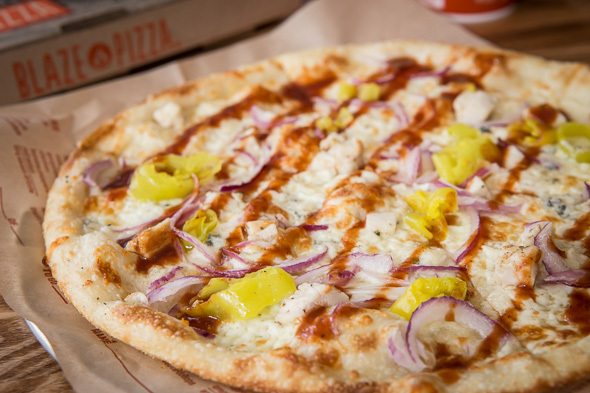 Gluten-free eaters fear not, Blaze has a crust for you too (granted it'll cost you an extra $4). Vegans will find dairy-free cheese, and really any allergy-afflicted eaters can partake, just inquire about the trusty allergen chart that they keep behind the counter.